In today’s competitive job market, skilled candidates have the advantage, and they're not only shopping around for the best compensation but the best benefits and perks. Reviewing these 25 unique and low-cost employee perks will help your organization create a robust employee benefits package that will appeal to top candidates. Unlimited Vacation Time: One of the more appealing employee benefits that any company can offer is unlimited vacation time. Employees must work a certain amount of hours to earn vacation time, but that vacation isn't capped. Healthy Cafeterias and Snack Machines: Having access to healthy meals, snacks, and beverages can go a long way toward increasing the health and well-being of employees. Find a vendor to bring in healthy snacks at wholesale and ditch the sweets and sodas. On-Campus Career Development: Learning is a major boost to employees because it fulfills both personal and professional goals. Use an online learning system to make it easy and low cost for all employees, or hire area experts to host seminars at the office. Wellness Facilities and Support: You can set up an unused office space or patio with some simple fitness equipment or create walking and bike paths around the office building. You can also offer a wellness room for meditation and yoga, or offer once-a-month chair massages from a local wellness provider. Corporate-Branded Swag: When employees feel part of something, they enjoy sporting branded merchandise. Work with a local printer to create low-cost corporate swag like water bottles, t-shirts, and more. Hand them out as incentives, at company events, and to new hires. Supplemental Insurance: There are a number of supplemental insurance programs that can be offered at group rates to employees for pennies on the dollar. Things like spousal life insurance, pet insurance, cancer care, and hospital cash plan can be valuable to employees who need this extra level of coverage. Special Interest Clubs: Open up your company to area clubs that help teach employees important life skills. This can include public speaking clubs, weight-loss support groups, craft circles, and even safety awareness clubs. Financial Services and Banking: Many area financial institutions offer low-cost and free access to banking services. This can include mortgages, savings and checking accounts, and financial planning. You can even have an ATM installed in your company cafeteria to make it easier for employees to access fast cash for healthy lunch choices. Flextime and Work at Home Options: Employees are more apt to enjoy the freedom of working from home at times and having more flexible scheduling. Many people are working parents who are juggling other life responsibilities. Daycare and Housing Discounts: Look around your community to apartment complexes and housing developments where referrals earn the company generous discounts for employees. Daycare centers often offer these referral discounts as well. Generous Parental and Caregiver Leave: Give new parents and employees caring for adult children or aging parents the option to get more leave when they need it. Flexible working arrangements can also support this benefit without cutting down on productivity. Volunteer Time Exchange: Reward employees for giving back to the community. Let them exchange their volunteer service hours for paid time off. Give employees an opportunity to use payroll deductions to donate funds to their favorite causes, and offer to match them. 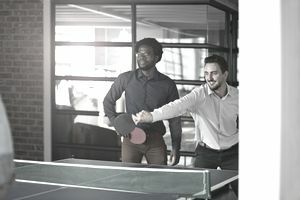 Team Bonding Events: Bonding can be as simple as a weekly basketball game held in the company parking lot or a team visit to a local museum during off-peak hours. Just have fun with it. Free Desktop Music: Give employees access to streaming music and headphones right at their workstations. This low-cost perk can help employees focus and reduce stress. Technology and Community Discounts: Many companies offer technology discounts to corporations. Why not pass these discounts down in the form of a corporate discount program? Maintain a list of vendors offering coupons and discounts on everything from software to travel. Fitness Classes: Once a month, host a local exercise instructor to teach employees yoga, spinning, resistance training, running, and other forms of fitness. Make this a regular part of your wellness program. Arrange for discounts for participants who want to continue these classes. Community Education: In the summer months, open up your facility in the evenings for community education efforts. Adults can learn a variety of life and career skills, including those that they can immediately transfer to their work. Quarterly Cookouts or Potlucks: Give employees something to look forward with a small get-together held in the company cafeteria. Make this a family event whenever possible. Ask employees to bring a dish to pass or something to add to the grill. Free Corporate Library: Set up a reading room and include various business books, movies, and magazines that employees can enjoy. Parent Rooms: Give all new parents access to a special private room where they can transition back to regular work with a baby. This room can also double as a comfort station for pre-natal mothers who need to rest and breastfeeding mothers. Annual Learning Stipends: A learning organization is a thriving one. Give employees the option to participate in an industry certification program, a college class, an industry seminar, or another accredited program of their choice once a year. Game Room: Give employees a place to de-stress and unwind with a break area complete with gaming equipment. This can include a mix of physical games and mental games. Personal Care Services: Bring in a hair stylist for once-monthly haircuts for employees or try a dry cleaning service drop-off. College Scholarships for Employee Children: Each year, let employees request scholarships for their children heading to college. Select recipients of awards based on their grades and achievements. Vacation Reimbursement: When employees head out for vacation, offer them a chance to be reimbursed for 50 percent of their meal and gas costs. This encourages employees to worry less about taking time off, and they return refreshed. When putting together a perks and benefits program, make sure you have a clear idea of what behaviors you'd like to influence in your employees, such as better health and well-being, and design it around these goals. Be creative, and don't forget to poll your employees to find new ways to sweeten the compensation. Doing so will help your company retain more high-performance employees and impact your bottom line results.